RCDL 2005 was held at the Yaroslavl State University located in the city of Yaroslavl founded almost one thousands years ago around 300 kilometers from Moscow. 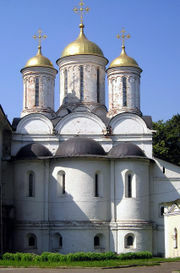 Yaroslavl proudly bears the nickname of "a pearl" in the Golden Ring of ancient Russian cities. This year 27 submissions were accepted as full papers and 13 as short reports. More than 100 researchers and practitioners from academia, libraries and industry participated in the conference. For the third time conference was collocated with Russian Information Retrieval Evaluation Seminar (ROMIP). This annual event summarizes the independent evaluation of text retrieval systems during a year (this initiative is similar to TREC, SUMMAC or CLEF). Another interesting collocated workshop was organized by Yandex (company running well-known Russian Web information retrieval system) In 2004 - 2005 the Yandex company has established a stipend to support a scientific researches in the areas related to Web. The results of these research projects were reported at this collocated workshop. Thanks to the activity of Andreas Rauber, a liaison between ECDL and RCDL has been established, including exchange of PC members of the respective conferences in 2005.